Two water meter inputs, ORP and conductivity inputs with sensors with 15 ft cable, flow switch input, eight relay outputs (seven with drop cords), and Power On/Off switch are all standard features. Includes seven relays for bleed, chemical feed, and alarms; expandable up to 12 relay outputs. 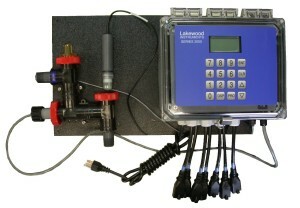 2830e LONWORKS Technology-based ORP and conductivity controller with plumbing and flow switch. Eight relays are integral to the system. One is dedicated to blowdown. The others may be configured for ORP setpoint (direct or reverse), inhibitor feed on conductivity, water meter, percent of time, or schedule feed. ORP range is -1000 to +1000 mV and conductivity range is 0-5,000 µS. -EZWEB -WEB plus Broadband Internet two-way hub that is independent of any site infrastructure and can have up to four 2000 series controllers linked to it. Also functions a local WiFi Hotspot for those with password. Requires one year service agreement part number 126977. SEE 2000e SERIES CAPABILITIES SHEET FOR FURTHER INFO. This controller model is available on a mounting plate- Call factory for part numbers.